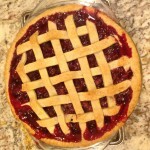 I wanted to share one of my favorite Thanksgiving pie recipes with you. 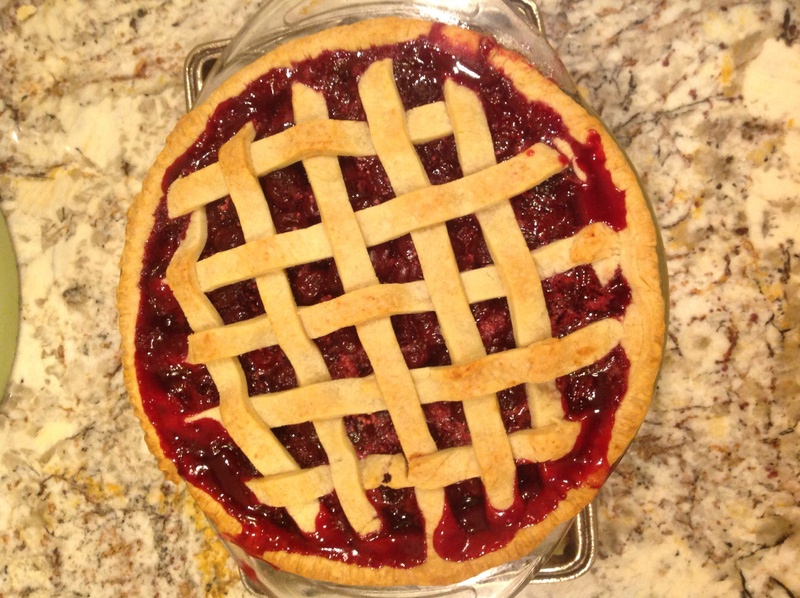 Cherry pie is my husband’s favorite! His mom used to make it every Thanksgiving and is one of those dishes that you love not just because they taste so good but also because they bring memories to your heart. I always go traditional on my turkey and side dishes but I love changing up desserts…I have made a twist on this original recipe and I have to say I’m so proud this year it came out better than ever…it was the winner of all my desserts! For the crust: mix first 3 dry ingredients in a bowl with a whisk. Add the butter and work the dough with your hands until you see small pieces of dough forming the size of peas…the add the ice water and get the dough all together. If you think it’s to dry add a little more tbsp of water until everything comes together. Cut the dough in 2 equal pieces and roll it with a little flour on the bottom until you get a thin disk. Put it on the pie dish previously buttered (to avoid dough to stick at time if cooking). Roll the other piece of dough and save it for the top of the pie.you can put it in a plastic wrap as a disk and leave in refrigerator for at least and hour. Plastic wrap the pie dish with the crust in it and put in refrigerator as well. Cook it in the oven already preheated at 400 degrees for 5 minutes and after lowered the temperature to 350 degrees and cook it for another 40 minutes or until you see bubbles starting to form and crust getting nice a golden brown. I like this web site very much, Its a very nice post to read and receive information. “I have found that if you love life, life will love you back.” by Arthur Rubinstein. I just want to say I am new to blogging and certainly enjoyed you’re web blog. Almost certainly I’m going to bookmark your blog . You amazingly come with tremendous stories. Kudos for sharing with us your website. Thanks for your personal marvelous posting! I truly enjoyed reading it, you may be a great author.I will ensure that I bookmark your blog and may come back later in life. I want to encourage you continue your great posts, have a nice day! What i don’t understood is actually how you’re not really much more well-liked than you might be now. You’re so intelligent. You realize therefore significantly relating to this subject, produced me personally consider it from so many varied angles. Its like men and women aren’t fascinated unless it is one thing to do with Lady gaga! Your own stuffs outstanding. Always maintain it up! I actually wanted to write down a quick remark to say thanks to you for some of the fabulous tips and tricks you are sharing at this site. I feel happy to have discovered the web site and look forward to so many more entertaining minutes reading here. Thanks once again for all the details. Write more, thats all I have to say. Literally, you clearly know what youre talking about. Love all the great ideas and I have made some of your recipes. They really work! I followed exactly what you said and all the extra secrets you give out. Thank you!!! It’s been great! I wanted to write down a comment to say thanks to you for some of the awesome guides you are giving at this site. Your blog deserves all the positive feedback it has been getting. Keep it up! I simply want to say I am just all new to weblog and actually savored this web-site. Almost certainly I’m want to bookmark your blog post . You surely have amazing articles. With thanks for sharing with us your web site. You are so interesting! I do not think I’ve read a single thing like that before. So good to discover someone with original thoughts on this topic. Seriously.. thank you for starting this up. This web site is one thing that is needed on the internet, someone with a little originality! An impressive share! I have just forwarded this onto a friend who was conducting a little research on this. And he actually bought me lunch simply because I found it for him… lol. So allow me to reword this…. Thank YOU for the meal!! But yeah, thanx for spending some time to discuss this subject here on your website. This blog was… how do you say it? Relevant!! Finally I have found something which helped me. Many thanks!